Individual ACDA families have raised awareness and research funds in many ways. Please click on the links below to read about completed individual fundraisers and campaigns. Although the individual fundraisers listed below have been completed, donations can be made directly to the ACDA at any time via the “Donate” menu button. Please contact us at at secretary@acdassociation.org if you would like us to add a summary below of your individual fundraiser benefiting ACDMPV research. Let’s raise money in memory of Seb for ACD. Visit the fundraising page HERE. The Davey family from Northampton took part in the Silverstone Half Marathon to raise money in memory of their baby who lost her battle against a rare lung condition. Hope Davey passed away in September 2014 at the John Radcliffe Hospital, barely a year after she was born with Alveolar Capillary Dysplasia (ACD). Read the newspaper article HERE and visit the fundraising page HERE. Please help me wish Sadie Rose happy birthday and remember her beautiful short life. Visit the fundraising page HERE. “$20 for the 20th” is a request with gratitude for $20 donations in honor of Johnny’s upcoming birthday on February 20th. 100% of donations will be donated to the National Organization for Rare Disorders and specifically applied to the “Alveolar Capillary Dysplasia” (ACD) research fund in honor of Johnny. Visit the fundraising page HERE. On each Thomson Airlines flight, money is collected for charity. Each airport base has a local charity that they nominate and then a quarter of all money raised throughout the year goes to that charity. This year I nominated The David Ashwell Foundation and have just found out that it is now the official local charity for London Gatwick Airport. We have well over 100 flights per week, both long and short haul around the world so many thousands of people will now be made aware of ACD and lots of money will be raised for more research. Am so proud of my colleagues for voting for the David Ashwell Foundation and to Amelia and Simon for setting up a UK based charity. 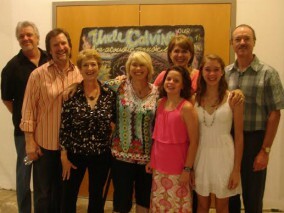 Sara Hickman, the 2010 Texas State Musician, headlined a benefit concert in Dallas, Texas on June 15 for ACD research. We welcomed family, friends and guests to Uncle Calvin’s Coffehouse for a night of live acoustic music by Sara and the Houston based trio, 2-Bit Palomino. Friends that could not attend the concert sent in donations to NORD so we are still waiting to make the final calculation on how much money we raised but expect over $3,000. It was a memorable evening full of laughter, raising awareness (even with our friends) and a moment of silence for Eric.